Know when it's time to cut and run. Four of our writers share a tale of anchoring and mooring woe, to save our readers from having to suffer the same fate. Anchoring. It’s one of those boating activities everyone needs to learn and become adept at but that no one will likely perfect. 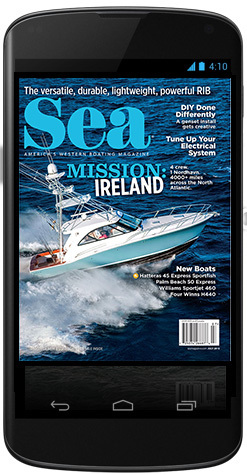 Even longtime boaters will encounter an anchoring situation that will test their mettle. Sometimes, even a mooring situation can turn for the worse. We asked four of our regular writers to share a tale of an anchoring or mooring situation that didn’t go exactly as planned, and they all obliged. In one case, the crew didn’t even get the anchor deployed before the trouble started. Read on if you want to feel a little superior to these veteran anchor-setters. Oh, and if you want to learn something about how to avoid the same trouble. Know when it’s time to cut and run. The seas are calm. The fish are biting. It is the kind of day we don’t expect anything to go wrong, so something probably will. After enjoying an afternoon of fishing with two of my kids and a friend aboard, we start hauling up the galvanized Danforth-style anchor, only to discover it is stuck fast to the bottom. We yank, tug and maneuver the boat to pull it from different directions, to no effect. Knowing how expensive a new anchor, rode and chain will be, I really don’t want to abandon the gear. I was in a similar situation years ago on a charter fishing boat and saw how the captain dealt with the situation, so I figure I know exactly what to do: power the boat forward and in a circle, to apply a huge amount of pressure to the anchor without any risk of running over the line. When I saw this done, the procedure freed the anchor but applied so much force it bent the Danforth’s flukes out. True, the anchor was trashed. But at least the captain got his rode and chain back, along with a new piece of yard art that was surely a good conversation piece. I figure I am in the same situation and the anchor is a goner no matter what I do, so I may as well try to bend the flukes out and salvage what gear I can. I shift the boat into forward gear, cut the wheel slightly and apply throttle. 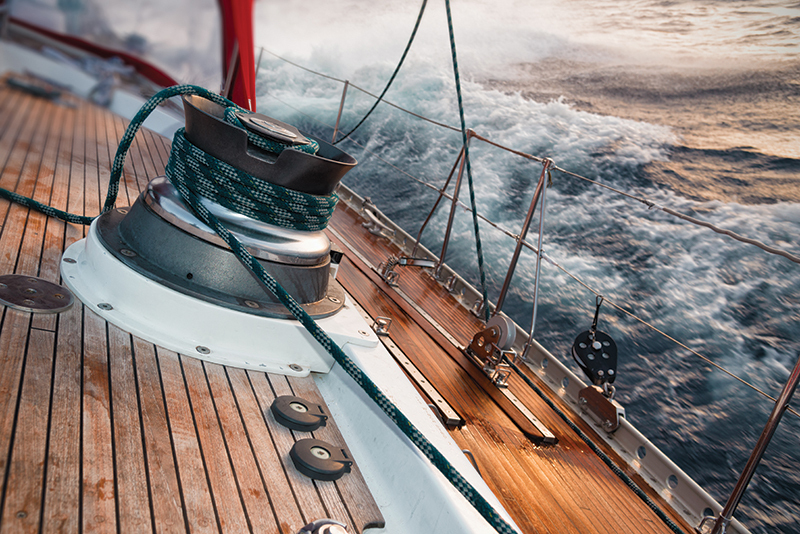 The line comes tight — scary tight — and the bow pivots around it while putting tremendous pressure on the anchor. Still, however, it neither bends nor pulls free. I apply more power, and then more yet again, until the tension is pulling the bow of my boat too far down into the water for comfort. Being a relatively cautious person, I figure I better lay off the throttle, rather than push it any further, cut the line and write it all off as a loss. Here’s what I haven’t counted on: The entire time I have been increasing the pressure on the anchor line, it has been stretching. And when I shift the throttle back to neutral and remove all of that pressure, the anchor line snaps back like a giant rubber band. It violently yanks the boat sideways, takes part of the bow underwater and instantly floods the deck with knee-deep brine. Fortunately, once all of the kinetic energy stored in that stretched out anchor line is released, the bow bobs right back up. The self-bailing cockpit takes a few minutes to drain — we help speed the process with a bucket — and there is no harm done beyond a bit of a scare. And, of course, a lost anchor, rode, and chain, which I willingly cut free and abandon. Colossal stupidity ends with an $11,000 yard bill. Sometimes things go right even as they’re going horribly wrong. After a rolly night in Prisoner’s Harbor on Santa Cruz Island, we decided to drive 4 miles up-island to the more comfortable Fry’s Anchorage that is long and narrow and requires setting lines fore and aft. We leave Prisoner’s towing the dinghy — to use it to set the aft anchor — and we tie it with the first thing at hand, a dockline. And that’s when the trouble starts. Once in Fry’s with the bow facing in, I put the boat in reverse to stop and drop. I hear “chunk, chunk, clunk,” and the engine dies just as the wind pipes up from out of nowhere to 18 knots on the beam. I look back to see the dinghy sucked two-thirds under the transom; just the outboard is sticking out. We have wrapped the prop and are being pushed onto the rocks to the left. We rush to raise the mainsail, to get momentum and steerage. But the mainsheet catches in the cam cleat and jams hard with the force of the wind. The wheel is all the way over and immobile, because the dinghy is hobbling the rudder. With the main about halfway up, the boat spins hard, catches the wind — now up to 22 knots — and lies over on her side. She pops back up midway through her spin and then goes again, and then again. We complete three perfect pirouettes, and each spin brings us a little bit farther out of the anchorage and away from land. As we clear the last of Santa Cruz Island, we unfurl the genoa and head for Ventura Harbor, 30 miles away. That gives us time to free the mainsail and raise it all the way. The dinghy is still under the boat and taking so much pressure that it is banging the outboard against the transom. In the commotion, we never even see the inflatable floor rip loose and float way. I duck below to check the shaft: no water coming in. The boat is dry albeit in complete disarray. Coming back up, I hear a giant pop and the dinghy shoots out from under the transom as if the big boat has birthed the little one. Amazingly, it stays attached to the prop via a frayed bit of dock line and continues to follow us. At least now we can steer, although stiffly, since the line is still caught between the hull and the rudder. At the yard we discover that the force of the engine and the 22-inch prop pulled the engine aft, off its mounts, and in the process damaged the transmission. The shaft is bent, which is just as well, because we learn it has crevice corrosion. We make the best of it by getting a new shaft, new bottom paint, new engine mounts and a rebuilt transmission. Three weeks later we receive a five-digit yard bill and sail back to Long Beach in silence. Every calamity has multiple contributors and actions smart, dumb and careless. And there’s also luck, both good and bad. We had the good luck of the boat spinning away from shore and no one falling overboard. We had the bad luck of the wind coming up instantly and out of the wrong direction. • Don’t tow the dinghy. 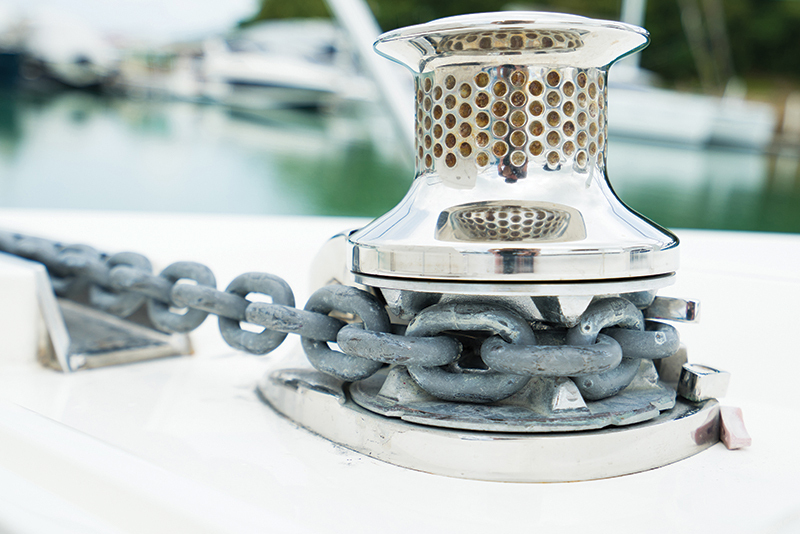 • If you must tow the dinghy, don’t use a dockline to secure it, even if you have a shaft cutter. Use a floating polypropylene line with a bridle. • Always shorten the line and take the dinghy on the hip before reversing, and don’t toss the bitter end of the painter into the towed vessel, because it will snake into the water. 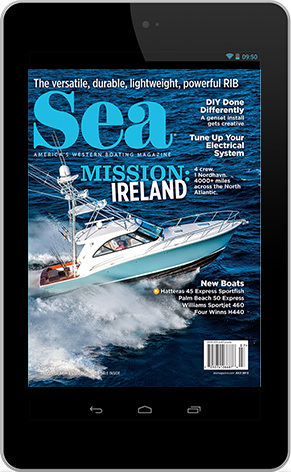 • Once the boat is hauled at the boatyard, make the best of it and get a coat of bottom paint. Keep an eye out for a sea lion floating on his personal rubber-floor island. Make sure to use this good insurance policy. We are anchored in the outer reaches of Hunter Bay, Lopez Island, having spent the day crabbing and enjoying the warm summer sun. The breeze has been gaining strength all afternoon, so we decide to weigh anchor and move Easy Goin’ deeper into the bay, hoping for greater protection from the winds that are forecast for the early morning. We reset the 35-pound Delta Fast-Set Anchor, with an all-chain 5:1 scope rode in 20 feet of water over a sand bottom, as we have done in the bay many times. About 3:30 a.m., the winds are blowing as we lie in the berth. We feel Easy Goin’ swinging on the hook and hear the wind gusts. I get up to check our hold and everything appears to be fine. Again, at 5:30 a.m. I get up to check the situation. The 20-knot winds and 27-knot gusts are out of the southwest — and we are dragging anchor. I shout to my wife, Arlene, “We’re dragging, and we need to move fast.” The wind is pushing Easy Goin’ toward a derelict fishing boat anchored in the bay. I start the engines as Arlene dons her PFD and heads for the foredeck to reclaim the rode. I put the boat in gear to take us away from the abandoned boat and put us over the anchor. We have retrieved all but the last 30 feet of rode when the bow jerks down suddenly as the windlass comes to a halt. “We are hooked on something,” Arlene says. Sure enough we have snagged something. For the next hour we work to free the anchor. We try every trick in the book, with no luck. Finally, we are able to claim all but the last 22 feet of rode to the chain locker. We can see the anchor 15 feet below the surface. And we can see the anchor cable of the derelict vessel lying over the flukes. We secure the chain to the bow cleat with the anchor safety line and begin cutting the chain with a hacksaw, to free Easy Goin’ from the snagged anchor. It takes us a few minutes to cut through one of the links and pry it open to disconnect the adjacent links. I slice the anchor safety line with my knife and watch $400 of ground tackle sink to the bottom. If we had a simple device called an anchor trip line, we might have been able to free the anchor from the cable by retrieving it by the crown rather than the shank. 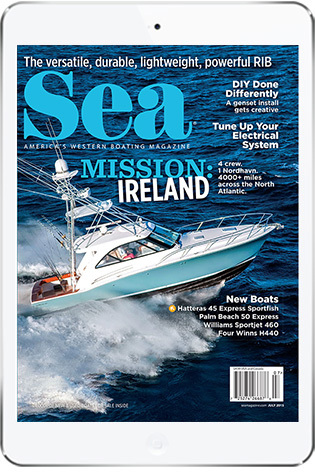 Once home, I began a new project and visited the local marine hardware store to purchase new ground tackle and the components to assemble an anchor trip line. A trip line is simple to assemble, and the components cost less than $100. Using an anchor trip line has a couple additional benefi ts. When setting the anchor, it becomes obvious when the anchor is dragging, because it causes the buoy to bounce. 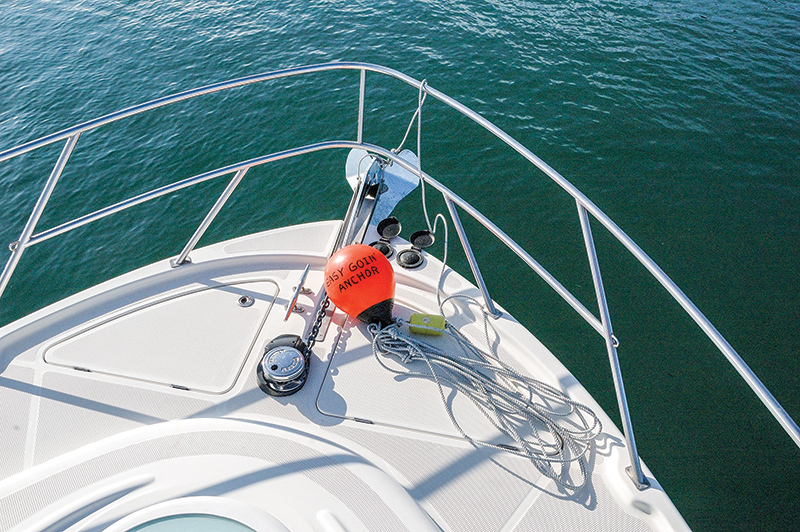 The buoy also marks the location of our anchor, making it less likely other boaters will foul our ground tackle. Knowing exactly where our anchor is set, and that we have a good chance of recovering it if it does foul, makes the less-than-$100 investment well worth it. Today, we don’t set our anchor without a trip line attached. Sometimes it’s better to be alone and circling. My husband and I and two crewmembers are delivering a brand new 60-foot sportfisher from New Jersey to Los Angeles. We’ve crossed the Caribbean in 66 hours nonstop just ahead of a hurricane, and lightning strikes have taken out most of our electronics. We limp into Panama well past dark. Knowing worse weather is approaching, we pass the wind-swept Flats anchorage and head instead to the tiny Panama Canal Yacht Club. It is already closed and without power, but our spotlight shows all the slips are occupied. We continue toward a gnarly concrete seawall used for overflow Med mooring, but it is also full. However, at the far end we spy a narrow gap. “No power, only water,” yells the club’s elderly night watchman. “That’s OK. We’ll take it,” we reply. John sets the bow anchor well out into the channel, as I tie a white buoy to the chain. Wind blasts our starboard beam as John cautiously backs us toward the seawall, until we can toss the watchman our crossed stern lines and two spring lines. The guy secures them and asks for our water hose, so we also pass him a soda, a candy bar and a $10 tip, at which point he waves and disappears into the torrential downpour. Despite midnight exhaustion, we keep the engines running and rig four of our beefy Panama Canal fenders behind the vulnerable swim step, plus two more between us and our upwind neighbor, a rusty, derelict sloop that’s unoccupied but piled high with scrap steel. Squalls intensify during the night. A dozen yachts abandon the Flats and somehow squeeze themselves into the already jammed seawall upwind of us. We all bounce in the surge and squeal like too many piglets at the trough. Then two big yachts back in downwind of us, having to sharing our small bollards. One by one, the upwind boats begin dragging down onto their neighbors, who have dragged too. If we don’t want to end up in a pile of broken hulls on the concrete, we have to cut and run. Getting ready, John assigns our tasks. Down in the chain locker, I dig up the bitter end and sever it with my fillet knife and then run to help Billy untie and secure all our lines, as John holds us in place. On deck aft of the windlass, Jimmy hauls out all the loose chain and prepares to jettison it on John’s command. The chain goes overboard en masse as John jams the throttles forward. We shoot out like an arrow. But, huh? Something is holding us 50 feet off the seawall! Looking down between my feet, I see a giant white straw. No, that’s our stretched-out water hose, narrowed to a straw’s diameter, attached to shore and still stuck in our deck fill. Just as I jump away, “sproing,” the white straw leaps straight up and disappears into the black sky. With that, we resume our escape without a scratch and spend the rest of the night slowly circling out in the relative safety of Colon Harbor. Daylight reveals the carnage we’ve avoided. What did that nearly fateful evening teach us about mooring? • It might be safer to motor in circles than to get smashed onto an inhospitable dock. • Buoying our ground tackle allowed us to recover it under safer conditions. • Obviously, untie the dock lines before getting underway. But nobody remembered hooking up that water hose, so it’s now on our checklist. • Be prepared to cut the bitter end and run to save the boat and crew.